Star Wars: Episode IX could end the Skywalker saga not with a big bang, but with a big bad. 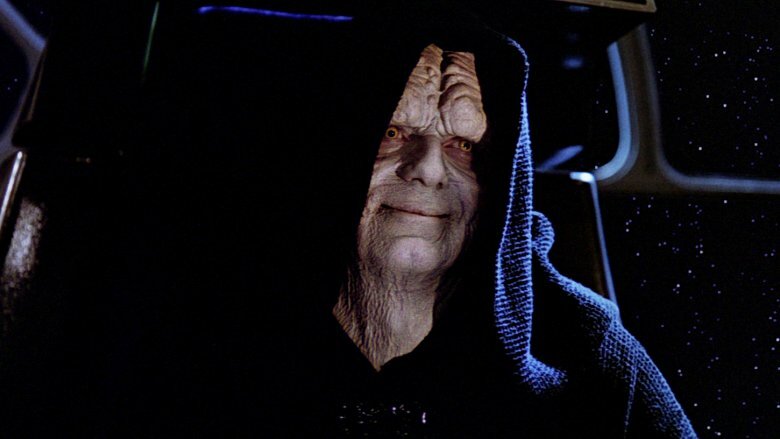 According to a new rumor surrounding the J.J. Abrams-directed feature, the film might bring back a nefarious old villain — none other than the red-eyed, wrinkle-faced, sinister schemer and Sith lord Emperor Palapatine. 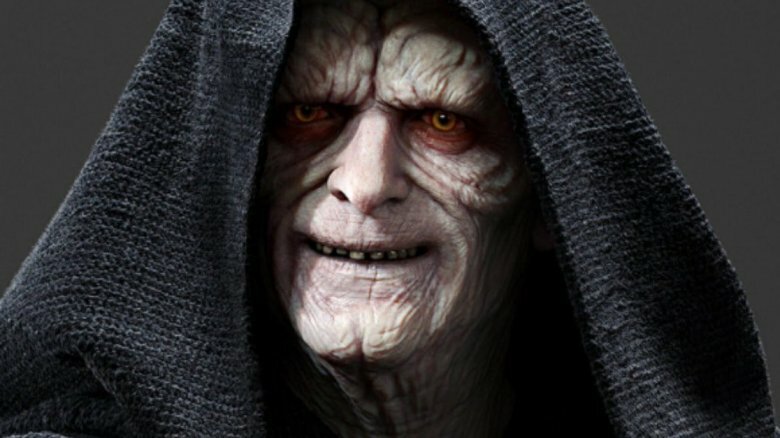 An unnamed, unverified source relayed to Express that Emperor Palapatine, whom audiences last saw on screen in the 2005 prequel film Revenge of the Sith, will indeed "play a role" in the yet-untitled Episode IX. The leaked information claims that an intense intergalactic tête-à-tête is in the cards for Palpatine and — wait for it — Kylo Ren. Apparently, actors Ian McDiarmid and Adam Driver will share the screen for a scene in which the angsty new Supreme Leader of the First Order comes face to face with Palpatine, who shows him plans for a weapon the Empire can use to crush the Rebel Alliance. The full statement from Express' source purports that Kylo will appear with an "ignited lightsaber, presumably his cross-guard lightsaber," and slice through "a blast door on some jungle planet" before he steps into what looks like a vault. From there, Kylo is seen "holding a square object that projects a projection of Emperor Palpatine" raising his hand in front of Kylo and displaying "blueprints or plans that could be a new weapon." There's more to unpack here than there are gamblers on Canto Bight, starting with the "jungle planet" Kylo reportedly roams around on during Episode IX. Express notes that this could be the remote planet of Pillio, but that world is primarily aquatic, covered in an enormous coral reef and freckled with coral caves home to various different sea critters. However, despite not being an all-out jungle planet, Pillio has an important connection to Emperor Palpatine: the planet actually held one of his observatories.On the other hand, perhaps the mysterious planet is actually Byss, a terrestrial-class planet in the Deep Core that Palaptine used as his secret throne world, personal retreat, and the location of his Imperial Citadel and his collection of clone bodies. There are over 100 jungle planets documented in the Star Wars canon, and even more than are jungle-adjacent, so it's difficult to say which world is the one that Kylo is rumored to venture to in Episode IX. As for the square projector Kylo apparently has in his possession, it doesn't immediately strike as unusual. He's communicated with others in far more unusual ways — who could forget the Force-fueled chats he had with Rey (Daisy Ridley) in The Last Jedi? — so striking up a conversation with Emperor Palpatine via a holographic projection doesn't seem strange in the slightest. The topic of their discussion, however, is worth exploring. The Empire has a long history of developing weapons to wipe out its enemies, but the "bad guys building something that will obliterate you and everything you've ever loved" plotline is a little tired at this point. Fans have already seen the Starkiller Base and two separate versions of the Death Star, and have learned of the Sionver Boll-developed electro-proton bomb and the Clone Wars-era heavy cruiser Malevolence. How much more crafty can the Empire get with its super-weapons? Does the coalition of baddies really need to? And if the Empire truly does plan to create another Death Star-type destroyer, will Star Wars fans even be impressed by it? Unfortunately, when it comes to rumors like this, the uncertainties don't end there. The biggest question here is whether it even makes sense for Emperor Palpatine to show his mean mug in the Star Wars universe again. If Emperor Palpatine does "play a role" in Episode IX as he's rumored to, his presence would help solve the sticky villain situation that came about at the end of The Last Jedi, when Kylo sliced in half Supreme Leader Snoke (Andy Serkis), the head of the First Order. While Kylo quickly assumed the position of power for himself, realizing his ultimate goal, many fans were disappointed that they never got to learn Snoke's full backstory before Kylo became the new Supreme Leader. But, according to a fan theory, they still might discover the truth — the jaw-dropping truth — about Snoke in Episode IX. Popular speculation amongst the Star Wars fandom is that Emperor Palpatine and his master Darth Plagueis actually created Snoke. An unidentified Reddit user theorized that Palpatine and Plagueis mess around with the Dark Side and create Snoke, and the Force "retaliates by creating Anakin," who later becomes Darth Vader. After Palpatine kills Plagueis in his sleep, which the theory-poster believes was motivated by "reasons revolving around how they'd treat" Snoke, he hides a young Snoke in a place "where he cannot be found, but is also provided for." As the theory goes, Palpatine then teaches Snoke to use the Dark Side of the Force, grooms him to become an evil leader, and eventually "fulfills his promise" and appoints him as the Imperator. Palpatine then relays to Snoke that he as an "incredibly important destiny" and must search the Unknown Regions of the galaxy to discover "the source of the Dark Side" and potentially find "eternal life" and a "way to resurrect Palpatine in the event that he's killed." "Vader was not to be the successor to Palpatine. He was simply a pawn in Palpatine's endeavors, using him to discover the great mystery. But Snoke, through his refined vision of the Skywalker family and the galaxy, has decided how to go about completing his 'father's' quest, starting with destroying the last living Jedi who caused Palpatine to fall," the theory states. This theory roots itself in the truth that Palpatine had a contingency plan (literally named the Contingency) in place to dismantle the Empire if he were to die. Palaptine believed that the Empire couldn't live on without him at the helm, but it did, and the First Order founded their system of beliefs on Palaptine's legacy. Now, as far-fetched as some may find it, this theory provides a solid explanation for how Palaptine could appear on-screen even after his death, offers an interesting backstory for Snoke that connects him to the dark-sided leaders of yesteryear, and gives Kylo his first mission to carry out as the new Supreme Leader — journeying to a planet where Palpatine hid instructions to destroy the Empire after his death and finishing what Snoke started by completing Palpatine's grand plan. It would be pretty mind-boggling to bring Palpatine back in the 11th hour, but crazier things have happened in the Star Wars franchise, and really, there's no telling what writer-director Abrams has cooked up for Episode IX. As with all Star Wars rumors, fans won't know if this one is true until they see Episode IX in theaters on December 20, 2019. The best anyone can do in the meantime is hope that Kylo will get rid of those insanely high-waisted pants before his rumored conversation with Palpatine, and that Episode IX won't reveal that Rey is actually related to the Emperor in some way. Let's face it, we can only handle so many "I am your father" twists in one lifetime.